Every year, 80 billion honeybees are trucked into California’s Central Valley to pollinate nearly one million acres of almonds trees. This past February was history’s greatest gathering of honeybees, coming at a time when hive populations are facing 44% yearly die-off rates and the state copes with drought. 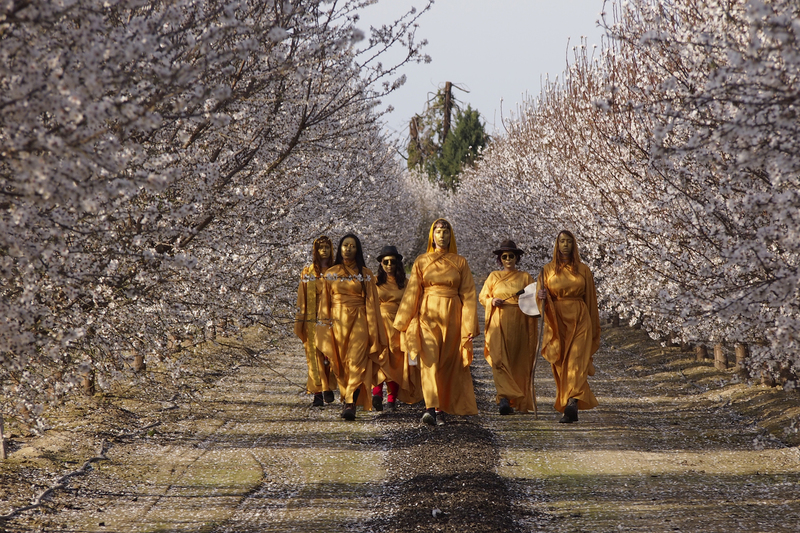 During this mass pollination event, a crew of six women costumed in gold performed a five day 100 mile walk through the desert, interviewing farmers and beekeepers along the way. Part performance art, part ritual, part activism, Equilibrium Rites seeks to raise public awareness of this ecological crossroads to instigate healing and inspire creative response to crisis. 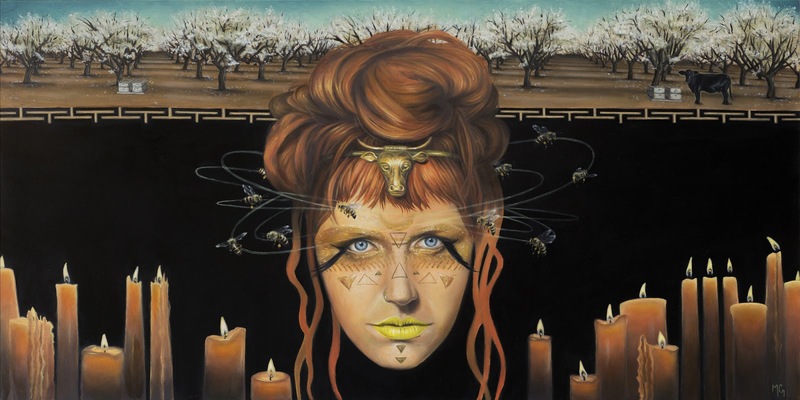 Beginning on Saturday, August 6th, Project Director Meesha Goldberg will exhibit a series of evocative visionary oil paintings based on the ritual walk in an exhibition also entitled Equilibrium Rites at LA’s The Hive Gallery. Also on display will be photographs documenting the performance, taken by renowned punk photographer James Stark, along with a short documentary on the experience, and a display of artifacts by Joanna Brook. 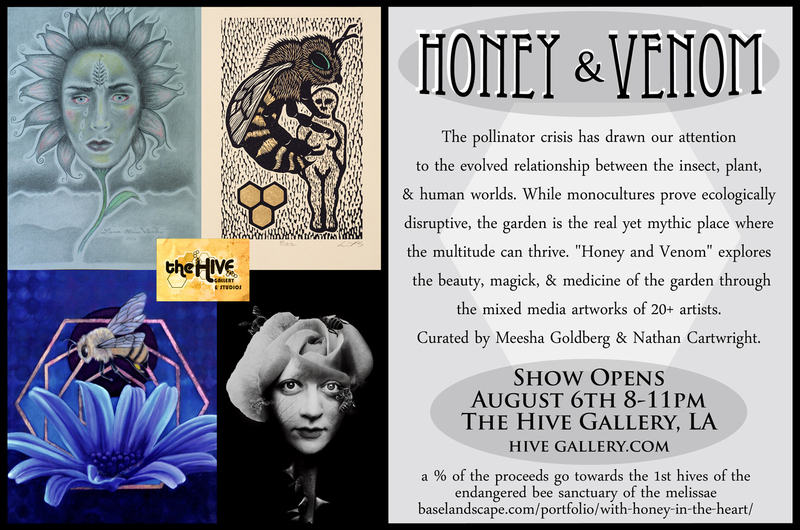 Running concurrently with Goldberg’s solo show will be a bee-themed group show entitled Honey and Venom, which she curated along with gallery director Nathan Cartwright. Participating artists include: Peca, Katelan Foisy, K Lenore Siner, Lana Gentry, Elizabeth Shupe, Kaylee Holz, Theodore Holdt, Inge Vandormael, Liv Rainey-Smith, Kamina Kapow, M de Vena, Denise Bledsoe, Nyahzul Blanco, Evgeniya Golik, Ivonne Escoto, Alex Quintero, Mark Brunner, Joon Alvarado, William J.Dunn, Amanda Sage, Steven “Wireboss” Darden, Nathan Cartwright, Ricardo Ales, and Donna Zoell. A percentage of all art sales will go towards the establishment of a bee sanctuary in Hawaii, directed by San Francisco bee activist Patricia Algara, who participated in the Equilibrium Rites performance. For more information on the Equilibrium Rites project you can visit This Link. Equilibrium Rites and Honey and Venom will be on Exhibit through August 26th, 2016, with an Opening Reception that is Free to the Public on Saturday, August 6th, from 8 – 11:00 PM, at The Hive Gallery and Studios, Located at 729 South Spring Street in LA.